A group of firefighters in the U.K. saved a group of piglets from a large barn fire and were rewarded with sausages made from the rescued swine. BBC News reports 18 piglets and two sows were saved from a farm in Wiltshire in February after 60 tons of hay caught fire. Firefighters from the Dorset and Wiltshire Fire and Rescue Service battled the blaze, which was started by an electrical issue. The piglets were given a brief stay of execution but met their inevitable fate six months after the fire. Rachel Rivers, the manager of the farm, told BBC News the pigs were slaughtered and turned into sausages, which were delivered to the firefighters. "I'm sure vegetarians will hate this," Rivers said. 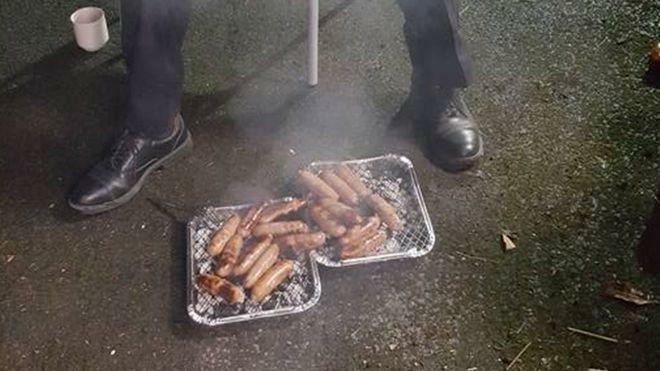 The firefighters barbecued the sausages at the Pewsey fire station, calling them "fantastic." The firefighters posted images of the barbecue to their Facebook page, which have since been taken down. Rivers defended the gesture, saying the move "was a good way of saying, 'Thank you.'" "I gave those animals the best quality of life I could ever give until the time they go to slaughter and they go into the food chain," she said. "You do feel sad at the end of it." A spokesman for the fire service thanked Rivers "for her generosity" in comments to BBC News, saying the sausages were "highly recommended." "We can tell no porkies, the sausages were fantastic," the spokesman said Tuesday. A spokeswoman for People for the Ethical Treatment of Animals (PETA) criticized the incident, telling BBC News the piglets were "no better off" for having been rescued from the February fire. "We'll be sending Dorset and Wiltshire Fire and Rescue Service packs of vegan sausages so that they can see how easy it is to truly be heroes for pigs -- by sparing them all suffering," PETA's Mimi Bekhechi said.